# 151A4.5 William 6 BIGELOW, son of Edmund 5 ( Benjamin 4( John 3, Samuel 2, John 1) and Olive (STONE) BIGELOW, was born 08 November 1791 at Middletown, Rutland county, VT. He was a physician by occupation. He married, on 19 October 1815 at Middletown, Dorinda Brewster, daughter of Orson and Zeruiah (Loomis) Brewster, a direct descendant of the Mayflower setters at Plymouth, MA. She was born 04 April 1795 and died 16 July 1883. They lived at Fairhaven, VT from 1815 to 1828, then at Bennington, VT, and later to Springfield, VT where he died 16 April 1863? (see below). While living in Vermont, he at one time served in the Vermont State Senate. 151A4.51t Olive Stone, b 06 Oct 1816 Fairhaven, VT; died after 1870 at Troy, NY; m 12 Apr 1838 Dr. Dewey 11. Robinson; they lived Vermontville, Barry co, MI and Marshall, Calhoun Co, MI 1838-1848, and then returned to VT. 4 children. 151A4.52t Emma Loraine, b 24 Aug 1818 Fairhaven, VT; d 31 Aug 1886 Troy, NY; m 12 Jan 1841 John N. Squires. 6 children. 151A4.53t Edmund, b 14 Feb 1821 Fairhaven, VT; d 27 Aug 1875 Springfield, MA; m 13 Sep 1847 Lucy P. Camp. 151A4.54 Ellen, b 11 Sept 1823 Fairhaven, VT; d 10 Oct 1834. 151A4.55 William Henry, b 06 Feb 1826 Fairhaven, VT; d 20 Apr 1846; unm. 151A4.57t Mary Sophia, b 16 May 1832 Bennington, VT; d 07 Dec 1882; m 15 July 1858 Samuel B. Sanford. 1 daughter. Dr. William Bigelow b Middletown 09 Nov 1791, studied medicine with Dr. Ezra Clark of Middletown, and received an honorary degree from Castleton Med. College. He came to this town in 1815, and practiced until 1828, when he removed to Bennington. In 1858 he removed to Springfield, MA and died there 20 Apr 1863." FORGE, Oct. 1979 Vol.8, #4, p.68--Confederate prisoners at Andersonville GA.
A George Bigelow, then of IA was exchanged at Atlanta 17 Sep 1864. Colors of the 10th Mass. 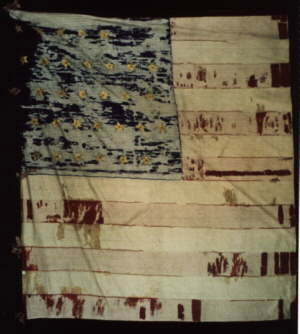 "These colors, sir were carried by our regiment in the following battles: Rappahannock Station, Mine Run, Wilderness, Spottsylvania Court House, Cold Harbor, North Anna, and Petersburg, and I am pleased, your Excellency, to be able to report to you to-day, in behalf of my comrades of the old regiment, both living and dead, that while these colors were in our care and keeping, they were never disgraced or dishonored; they were never captured or taken from us; they were never lowered when they should have been borne aloft; they were never in the rear when they should have been in the front; and they were never furled, when they should have been unfurled and thrown to the breeze; that under their folds and following their lead, and fighting in their defence, hundreds of our comrades sacrificed and suffered and died that the honor and integrity of the Old Commonwealth might be maintained, the Union preserved and the perpetuity of the Republic established."